Beat The Heat in Dubai → That's how! It is no secret that the summer months of June, July and August are really hot in the desert. Nothing can prepare you for how the 40-45 degrees will feel, before you exit the airport and meet the infamous “Wall of Heat”. Perhaps you’ve been to Spain or Turkey during the summer, where temperatures easily reach 40 degrees? There is, however, quite a distinct difference between the Mediterranean summer and the tropical heat that you will experience in the Arabian Peninsula. Without any knowledge in the meteorological field, I dare blame it on the humidity. Ironically, there is high humidity in the desert during summer. You would think that an enormous sand pit would always be dry and dusty – but in many ways, the Dubai summer is closer to the tropical climate of Singapore than the dry heat of Egypt. 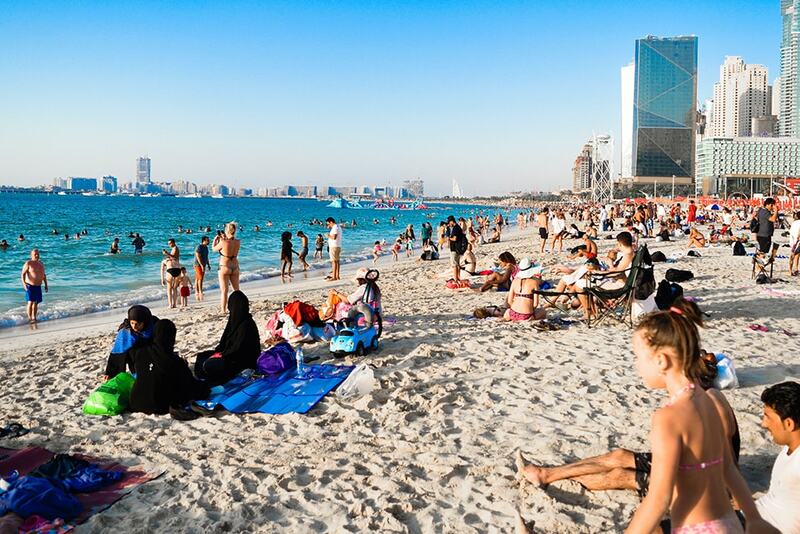 But – no matter that the average temperature hovers around 41 degrees at noon and 30 degrees in the night – there is no reason why you shouldn’t enjoy a holiday in the United Arab Emirates over the summer. ✔ Flight tickets are cheaper than any other time of the year. It’s the low season and why not take advantage of that? ✔ There are great discounts on a lot of the most popular tourist activities and holiday experiences, alongside the fact that all shopping malls have sales and offers on for almost 8 weeks. ✔ It is the perfect time for a relaxed and calm vacation experience. There are simply fewer people around during summer – and that means less traffic and less queueing. It is obvious that part of your holiday will have to be spent indoors, as it is well and truly hot outside. But that doesn’t matter too much, as Dubai offers such a wide variety of indoor activities, too. The Arabs are used to spending 4 months out of the year indoors. And in reality, it is no worse than us Scandinavians having to stay inside during Autumn and Winter, when it is raining or simply too cold to be outside. It’s just the opposite weather challenge here. All shopping malls offer much more than the mere shopping experience. They are carefully laid out with architectural highlights, as you walk through. There is always art on display, entertainment, music, delightful eateries, flowing fresh water, plants and all sorts of interior decorations that really make for an experience for both children and grown-ups. Fear not, if you’re not the keenest of shoppers – there are lots of interesting museums, cafés, art exhibitions, theatre performances, talks, cinemas, shows and more to explore. If you want a splendid night out, there is the Dubai Opera – and if you are traveling with children, you can enjoy the family friendly show La Perle Dubai, which is similar to Cirque du Soleil. There is the entire art quarter at Alserkal Avenue with permanent and temporary exhibitions, there are concerts, readings and much more going on around the city. For those traveling with kids, I can really recommend to cool down and have fun in some of the many water parks, such as Wild Wadi, Aquaventure at Atlantis The Palm or Legoland Waterpark. Remember to use SPF 50 sunscreen and to wear UV-swim shirts to avoid sun burn in the strong desert sun. Dubai also has some of the largest indoor theme parks in the World, like IMG World, Motiongate and Ferrari World in Abu Dhabi, if you are in the mood for a true adrenaline kick. Traditional Arabian Souks where you soak up a bit of Arabic culture and buy typical souvenirs for home, are also found in indoor versions to avoid literal melt-downs. Stroll through the lovely Madinat Jumeirah complex or walk over to Souk Al Bahar next to Dubai Mall. It is a little too hot to enjoy long outdoor walks – and the same goes for the beach. It’s just not comfortable at this time of the year. If all you really crave is pure and utter relaxation, you’ll find that the summer blaze is the best excuse for jumping into the pool for a soothing swim or for finding the nearest pool bar, where you’ll be offered a cold beer or a frozen drink in an instant. Have a lovely summer vacation – in Dubai – or where ever you are!